It's pretty simple. The boss asks if he is "Working hard or hardly working?" to which the employee responds "It's tough to say." This response means the employee is not working hard, and may actually be hardly working. 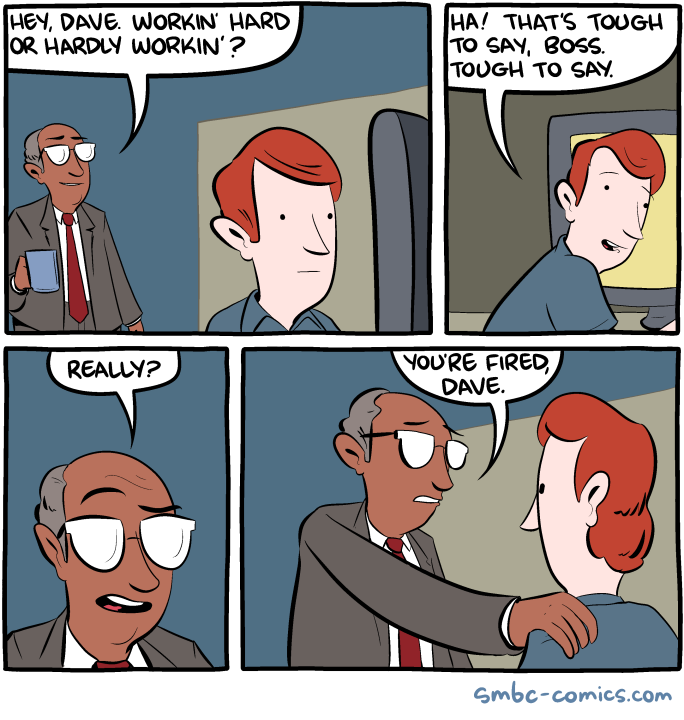 Such an unproductive employee is bad for a business, and so the boss fires him. There is no deeper meaning. CaptianKatsura wrote: It's pretty simple. The boss asks if he is "Working hard or hardly working?" to which the employee responds "It's tough to say." This response means the employee is not working hard, and may actually be hardly working. Such an unproductive employee is bad for a business, and so the boss fires him. There is no deeper meaning. huh. i guess they can't all be philosophy jokes. although that seems so senseless.